This past weekend CFA’s Executive Director, Nancy Watrous, was spotlighted in the Chicago Tribune. Take a look here or read below…. Being executive director of Chicago FilmArchives has its perks. Why, you could sit all day and watch the movies of Margaret Conneely (an amateur Chicago filmmaker who worked in the latter half of the 20th century). Not that Nancy Watrous has the time. Her calendars are full running the CFA, a nonprofit in Chicago’s Pilsen neighborhood that collects, preserves and makes available to the public films reflecting Chicago and Midwest history and culture that otherwise would be lost. It hosts events and has films viewable on its website, chicagofilmarchives.org. Part of the library’s collection were the films of Conneely. A: One of the places I took off to when I was in my early 20s was New Orleans. I got introduced to the film business there. I met a producer who had come out of New York, producing trailers. We talked, and he said he’d hire me once he got started. And he did. I was a production coordinator, I took script notes, arranged for locations. Later I got hired as an assistant in a prop department for films. My first film was “J.D.’s Revenge” (1976). When I moved back to Chicago (where she got a degree in Latin American studies and international relations from the University of Illinois at Chicago), I stayed in the business. This was late ’79. A: I had a background in film production. I’ve been a (Directors Guild of America) assistant director (for) commercial and industrial films and feature films in Chicago. I worked on “Nothing in Common” (1986) with Jackie Gleason and Tom Hanks. That’s how I made my living during the late ’70s and early ’80s. A: I heard about the Chicago Public Library’s collection, and that they were getting rid of it (the library was moving to a new location). There was an experimental filmmaker who made a little noise because he heard the films were going to be thrown out. I went to the library and made a proposal that before they got rid of the films they do an assessment. They had about 5,000 films. I made the case for keeping the collection together, with the idea that I could help decide where the collection would be placed. … It became clear nobody wanted all the films. … Eventually they offered the collection to us if I’d start a nonprofit. I had help from people in film preservation, and people from the University of Chicago graduate program. We were offered space in a building on LaSalle Street, free. We used that for awhile — we actually broke their elevator; films are heavy. We decided we had to take this seriously. So we found the space we’re in now. Q: And the library’s films were just a start. Q: People don’t think of Chicago as a film center. A: In Los Angeles, New York, even Austin now, it’s a major industry. Ever since I was young, people asked, “How can we become like Los Angeles, become like New York?” I’ve come to realize Chicago has always been huge for incubation. It doesn’t have the industry constraints or business constraints you have to deal with in L.A. or New York. (People in Chicago) do wonderful work, often more brilliant than things people do in those other places. Artists and musicians don’t have those standards they have to live up to. They can work outside the box and do work that’s unexpected, not derivative. A: I think there’s a human continuity component that focuses on films from before our time, and people want current and past films to be there for the future. It’s part of the human continuum, whether it’s researchers who want to learn about architecture that no longer exists or people who want to learn about social movements or people who come to Home Movie Day (a CFA event where people can share their home movies; this year it’s Oct. 18 at the Chicago History Museum). A: Some of them, it depends on how often they were used. And it depends on the stock. In the ’60s and ’70s the stock faded easily. That’s what got Martin Scorsese into preservation; he saw that films were deteriorating. A: We’ve got a pro wrestling film collection from the ’50s from California. It’s one of our favorites. We got it from Russ and Sylvia Davis (who lived and worked in Chicago for many years); they produced these wrestling matches. He was the commentator. Very dry sense of humor. They’re really entertaining to watch. The cans were rusted out, but the films were in great shape. Then there’s Frank Koza’s collection. He was a newsreel photographer who passed last year. We haven’t been able to process (the collection) but Frank had over 1,000 reels. It’s one we really want to get to, but we have another large collection we have to do. Travelogues. Right now I’m looking for funding for the travelogues. A: We stabilize them. We hand inspect them and enter any data, put on a new leader, fix splices. It’s pretty time-consuming. A: With a lot of the filmmakers, we try to get there and film them. Margaret Conneely was one of our first collections. We got her on film. She was in her late 80s when I first met her. (She died in 2007.) I think she’s a clever filmmaker, very funny and pretty bold. A: I love the Margaret Conneely collection in general. Another film we’ve got that I also like is “The New World of Stainless Steel.” On the can the title was “Iran,” and on the leader was “Iran.” We put it on a projector, and it was this industrial film by Republic Steel. Hilarious. It was made in 1959 or ’61. Everyone is talking about all the uses of stainless steel. It’s very surreal. I haven’t found it anywhere else. It was in phenomenal condition. A: There are really so many great finds, I can’t say I have a favorite. The Ruth Page collection goes back to the 1920s. There are hundreds of films of her performing that no one has ever seen. And they were sitting in a closet, these explosive, decaying nitrate films. Because she was so well known we were able to get funding from the National Endowment for the Arts and the Donnelley Foundation to get the film stabilized. A: Yes, we do. There’s a lot of people who can’t bear to throw away any of their film reels. A: We’re building this historical picture, a 20th-century picture, of Chicago through these films. But not famous events; life behind the scenes. We’re building this century of Chicago through these orphan films. A: Yes, every film archivist does. The mother lode. You might find footage, even if it’s damaged, of 1909 Chicago. But most (film) from before 1920 is lost, 90 percent is the number they use. That mother lode isn’t as important as the orphan films. A: I think all archivists have an “organizing streak” to them. We all like order. But it’s not necessarily because that’s how our minds work. In my case my brain seems to take in different influences and messages all at once and on top of each other. … It’s sometimes pure chaos up there and it’s very useful to have organizing tools to deal with my very unorganized mind. I particularly like color-coding. I recommend color-coding for everyone. A: I don’t have a lot. I’m sort of angry because I like to travel. That’s one thing I worry about; everybody does. Everybody today is too busy with their jobs. I feel that sometimes you have to walk away from your job a little so you can come back (recharged). Q: Where would be the first place you’d travel to if expense were not an issue? A: I love jazz. That’s worked out here because there are silent films, and we’ve been partnering and commissioning jazz musicians to score some of them. A: I’m lucky that I know (music writer) Peter Margasak because he turns me on to current names that bring me to that same zone where I was years ago. So I’ve come to know Mike Reed’s work a little, David Boykin and Jeff Parker. Not sure if they deserve or need more fame but maybe more money. A: There’s many people, but probably my first was when I studied dance with Frances Allis. She was probably in her 70s. She was a modern dancer and toured the world. She was such an artist. She taught us how to move. She was one of the first who knocked my socks off. I never became a great dancer; I was an OK dancer, though. But it went beyond dance. She taught us how to take in and appreciate the different aspects of art. She was the real deal. A: Twizzlers. I don’t like raisins. And the quality of movie theater popcorn got bad somewhere along the line. We’re almost finished uploading all of the Ruth Page films to the Ruth Page Collection Finding Aid (we have about 25 films more to go). After that we will be uploading the collection’s videos, whose formats range from 2″ and 1″ open reel formats to the more familiar cassette varieties of Betacam and Betacam SP. Thanks to a grant from the NEA and Donnelley Foundation, we were able to ship the tapes out to Bay Area Video Coalition to have digital preservation files made of each video. Be on the lookout for these uploaded videos in the upcoming months! The content of the videos range from oral history type interviews with Ruth Page collaborators to taped rehearsals and performances. I’d also like to remind you all that none of these Ruth Page Collection films or videos are fully cataloged quite yet (more on our decision to publish these materials early here). But we have good news! Thanks to another grant from the NEA, we’re currently in the beginning stages of cataloging. As we’ve mentioned before, describing a dance collection can be tricky and requires a deep understanding of dance and dance history. We are delighted to welcome Pamela Krayenbuhl on board to complete this project. 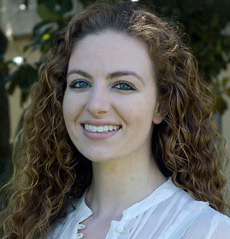 Pam is a PhD student in Screen Cultures and a Mellon Foundation Fellow in Interdisciplinary Studies at Northwestern University, and holds an MA in Screen Cultures and a Graduate Certificate in Critical Theory from Northwestern as well as a dual BA with highest honors in Rhetoric and Interdisciplinary Studies from U.C. Berkeley. Her research focuses on screendance, primarily dance film, while her other academic interests include intermediality, adaptation, authorship, and American popular culture. Pam is also a ballet dancer, choreographer, photographer, and poet. 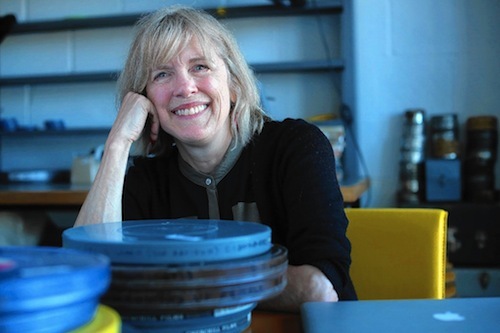 Pam’s dance background and academic interests will certainly prove invaluable throughout the year long process to catalog CFA’s Ruth Page Collection dance films and videos. While uploading the remaining films we came across what we think to be a pretty rare find. It’s a 16mm camera original reversal print featuring another pioneering Ruth of dance – Ruth St. Denis (1879 – 1968). In the reel (embedded below) Ruth performs her famous East Indian Nautch dance….enjoy!